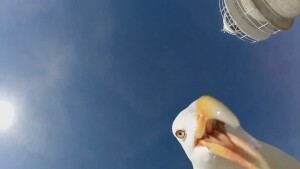 Seagull steals GoPro from tourist | News by Wales Express News, People Before Profit! Seagull steals GoPro from tourist and a shot of its cheeky face. MINE! This is the humorous moment a seagull captured some birds-eye-view footage of the Cies Islands after stealing a GoPro and flying around the bay with it. German tourist Martin Lozano (Youtube Channel) was lucky to retrieve his camera after the opportunistic bird crept up on it as it sat on a wall recording, and picked it up in its mouth. The seagull then set about flying away with it to the sound of Martin shouting and whistling for the bird to turn around and fly back with it. Landing soon after its first flight, the bird records its shadow as it swoops through the air and its feet as it touches down on a wall. It then runs off the edge and begins flying once again – this time it captures footage of the rocks, which jut out from the side of the cliff, and the water below. Appearing to fly in a circle of the bay, the bird touches down once again and rather humorously records Martin running towards it. The seagull then drops the camera onto the wall and manages to record itself looking down before it places its entire beak around it.